Tire Pirates has an experienced team of professionals on your side that can inspect damaged tires and repair minor damage. At our highly reputable full-service Calgary tire shops, we inspect tires at no cost and can complete repairs on site. We also install the best new tires when necessary. Keep your ride running safely, reliably, and efficiently with tire patching and other fixes at our shop locations in Chinook and Foothills, Calgary. Worn treads: Modern standards dictate tire tread depth should be at least 1/16 inch deep. Treadwear indicators are present on most tires, but you can use a treadwear gauge as well. Also, if you insert a penny into a tire groove and the top of Abe Lincoln’s head is visible, excessive wear is present. Uneven wear: Tires should wear evenly. If not, it can indicate more serious tire damage or other problems, such as wheel misalignments or suspension damage. The tires may have been inflated improperly as well. Visible damage: Other signs of damage include cracked or cut sidewalls. 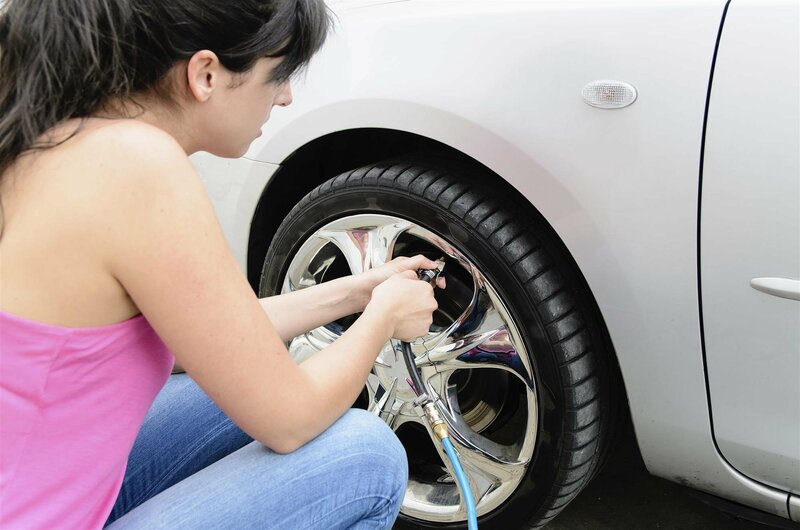 A blister or bulge in the sidewall indicates a weakness that can cause the tire to blow out; the only solution is to replace the tire right away. Vibration: Excessive vibration in a car can mean many things. Sometimes it’s a shock absorber or alignment problem. It can also be due to internal tire damage that will get worse if not corrected. Tire pressure leaks are common. Air can easily leak from the junction of the wheel and valve, and through the rubber as well. A leak can be so slow you don’t notice it and even change with the seasons, but significantly affect vehicle control. That’s because the sidewall flexes much more at lower pressures; a minor change in pressure can affect handling, make your car wallow, and reduce fuel economy. If the leak is localised, our technicians can patch your tires at the site of the problem. This is done quickly, and you can typically get right back on the road afterwards. If you drive over a nail or sharp object without noticing it, our team has the equipment to find the leak point and use tire patching to save you time and money. Where Can I Get Tire Repairs Near Me? Tire Pirates is your best choice for tire repairs in Calgary. Our experienced technicians are skilled in all types of repairs and can suggest top-quality replacements, if needed, at affordable prices. If your car has unusual sounds, vibrations, or handling issues, trust our mechanics to address any tire problems—call our Foothills repair shop at 403-907-0394 or our Chinook location at 403-907-0431 today.